Kids always seem to love making dioramas. In a way, it’s like building a little town or farm of their own. I think making dioramas are great for fueling the imagination. Because I know that some teachers are very limited in the amount of time allotted for art class, I have drawn some of the Halloween items, but this is not to limit the kids’ choices. They are welcome to add items or completely draw their own scene, as long as it is Halloween themed. Although this art project is suitable for any class, you’ll find this project, named “Halloween Diorama,” in the 4th Grade Projects Gallery in the sidebar. Click on the image above for a larger image. 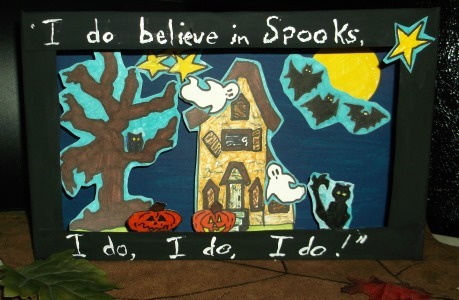 This entry was posted in Categories and tagged bats, black cat, diorama, dioramas, dioramas for kids to make, ghosts, Halloween, halloween diorama, i believe in spooks i do i do i do, idea, ideas, projects, pumpkins, spooks. Bookmark the permalink.